2nd post today, well better late than never, if you read my first one you'll understand. Over at Gingerloft this time the theme is Celebrations, as it's new year i thought i would stick with tradition and do a new year card. i'm using the new 2011 image available here. along with many other fab images. I coloured the image with my promarkers and used a freebie backing paper from Making Cards magazine, mirri card from my stash, flower beads from Debbi Moore, some little silver stars I found in a pound shop an MS punch for the edging and used some of the waste bits as faux brads and finally generated the sentiment on my PC. all on my base card of Centura Pearl from Craftersd Companion. Hi. Sucha lovely card with one of my favourite colours. Love your image and the border really sets it all off. Thank you for joining us at Tellens Place and good luck. Happy crafting. Great card, love the colour! Thank you for joining us at Craft Your Passion, MAWTT & The Crazy this week, good luck! Gorgeously coloured image and adore the dp used. Love the image! Great card! Thanks for playing along at Digi's With Attitude! 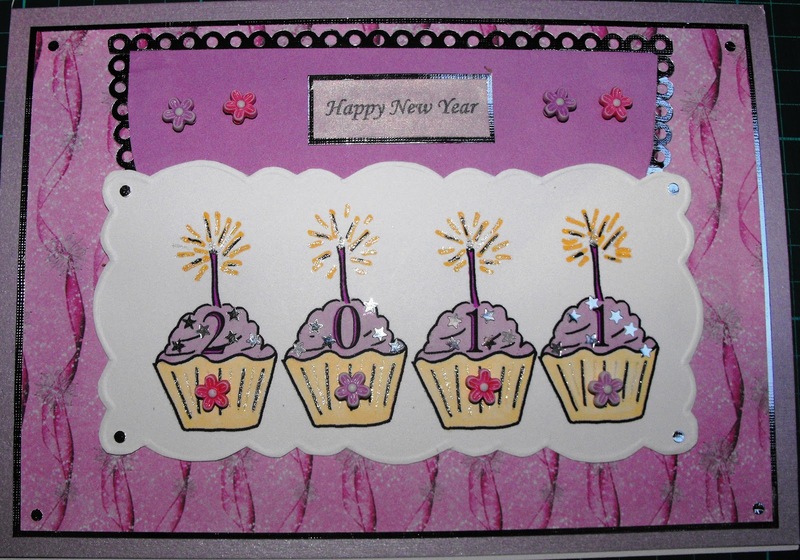 Hi Wendy, A fabulous card to kick start the New Year. Thank you for joining in the fun at Ellephantastic this month. Check the blog on 22nd Jan for more inspiration from the design team. Good luck in the draw. A fabulous card Wendy, love the yummy cakes. Thank you for joining us over at CYDA for our 'Anything Goes' challenge. How fun this card is and love the color purple. Thanks for joining us at Digi's With Attitude! this week! Lovely card. I love all the sparkle. Thanks for joining us in the LCI Challenge this week. 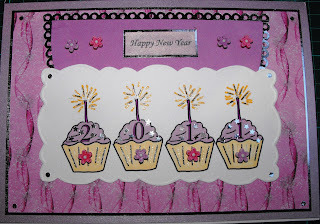 Wonderful, gorgeous card, what brilliant way to use the cupcakes. Love the purple colours - a super card!Thanks for taking up our challenge at Creative Craft World. Thanks for playing with us at LCI challenge this week and hop to see you back soon! Wonderful Color Combo! lovely card! Thanks for joining us at DWA! This week!!!!! Hi Wendy! Your card is beautiful! I wanted to thank you for being our guest for our shaped challenge at Stamps R Us! Your card there is beautiful as well :) Thanks for sharing your awesome talent with us! A brilliant New Year card. Thankyou for sharing with us at Creative Craft World for our 'Anything Goes' Challenge. DESIGNING FOR: CREATIVE CARD CREW, CRAFTY PURPLE FROG, KENNY K, BEARLY MINE DESIGNS. A great looking card with lots of interest. Great card love the image thanks for joining us at Digi's With Attitude! Love the cupcakes thanks for joining us at Tellen's Place. WOW! I so love those cupcakes! Thanks so much for joining us at Digi's with Attitude! Great card fab cakes, my favourite colour is purple too! Hey, that was sooo lovely. your card just simply captured my eyes and never let go. Those cupcakes so sweet looking and the overall design is captivating. Just change you new year wishes messages into for 2014 and that can be a great greetings for this year as well. Thumbs up.